Next Salon is scheduled, pls email me with questions and if you like to participate. We are 3 weeks away and I am looking forward to this get-together. I really appreciate the great response and we have an awesome group of talented photographers that will participate. – We’ll gather at my studio/home in Brooklyn (address below). – I am organizing this out of my love for photography and the people that share the passion. This gathering is not sponsored and nobody will try to sell something. – I’ll share a google doc where we can coordinate what drinks and snacks people can bring. A) bring your work that you want to share. Great opportunity to show work that is in progress, archived and needs to be revived, hard to show online or any reason that makes it important to you. Don’t be afraid, go loose, go crazy, let your heart speak. B) Show us someones work that deeply moves you, inspires you and tell us why. – Photography is empowering and that’s how we express ourselves. We all have different reasons what moves us and why. Let’s be respectful to each other at the Photo Salon and get inspired and inspire. We want to celebrate photography. Please confirm that you are still able to attend and if you have any other question. – First one April 18, 2018 7pm. 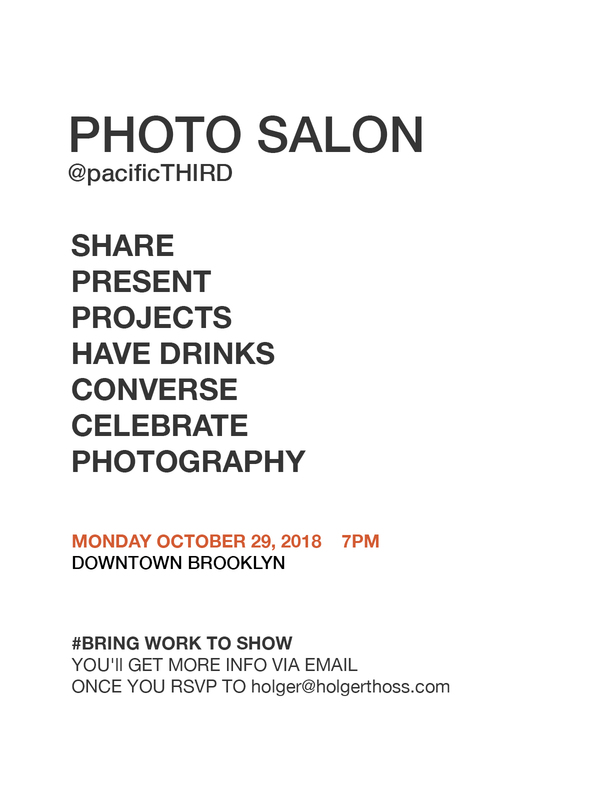 – Photographers* that attend will make presentations of their own work (10-20 images). – Showcase work of others that they find inspiring and interesting (10 images). – This is a free event, no sponsor, no fees, just bring something to drink. – This is purely for the love of photography, sharing and celebrating it. *If you love and work with photography but don’t create your own work you can present work of others. Please email me with questions and to reserve a spot.